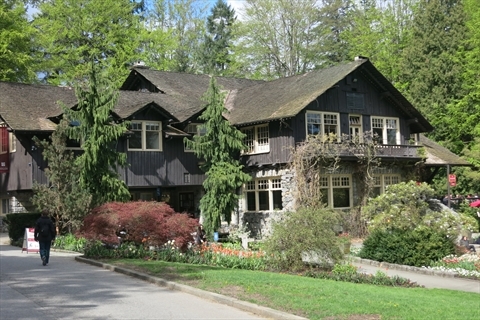 The Stanley Park Pavilion is a 1911 historic building in the middle of Stanley Park that home to Stanley's Bar and Grill, the Stanley Park Ecology Society offices, and is an events venue. It is also an event venue used for weddings and other banqueting functions. In addition to the fabulous architecture of the building, the grounds are landscaped with many beautiful flowers in a beautiful area surrounded by tall trees. For the flower lover this is heaven because the pavilion is between the Rock Garden and the Rose Garden! There are public washrooms in the front of the Stanley Park Pavilion. 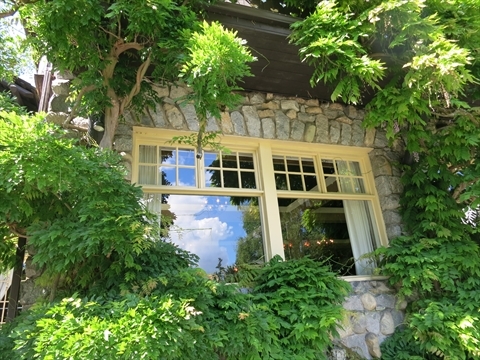 Designed to resemble a Swiss Chalet, this rustic log and stone building originally housed the Vancouver Park Board offices and a refreshment area for park visitors. 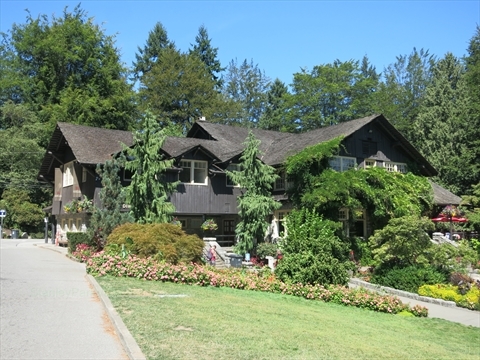 The building was constructed in 1911, enlarged in 1923-24, and is set in a lush landscape characteristic of Stanley Park's early development. Over the years, it has been used for formal occasions including a reception given by the Prince of Wales in 1919 for the families of soldiers killed during World War I. Park visitors have long gathered here, at the Stanley Park Pavilion and Malkin Bowl, to enjoy the food, music, and social pursuits. The Pavilion, built in 1911, became a hub of social activity as one of the Vancouver's original dining, dancing and refreshment venues. It has since hosted many weddings, VIP events and civic functions. 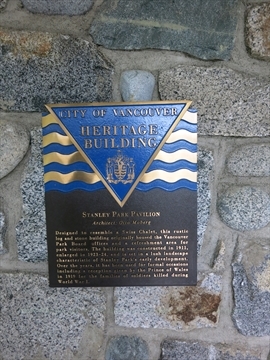 It is the oldest building in Stanley Park and an important heritage site. 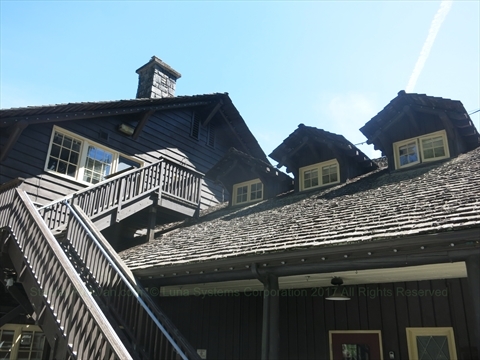 Otto Moberg, architect for the CP Rail chalets and lodges in Banff and Lake Louise, designed the Pavilion in a Swiss-chalet style using fieldstone and wood. The original bandstand, built in 1911 on what is now Malkin Bowl site, brought many Vancouverites together every Sunday. 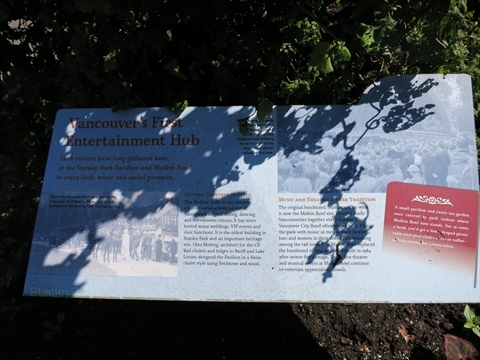 The Vancouver City Band often played here, filling the park with music as men in their bowler hats and women in their dresses sat watching among the tall trees. The Malkin Bowl replaced the bandstand in 1924 and was rebuilt in 1984 after severe fire damage. Today, live theatre and musical events at Malkin Bowl continue to entertain appreciative crowds. A small pavilion and rustic tea garden once catered to park visitors where Malkin Bowl now stands. For 10 cents a head, you'd get a linen-draped picnic table with your choice of tea or coffee--and ice cream, for 5 cents extra. The Stanley Park Pavilion is also an wedding and banqueting venue. It offers complete boutique weddings with their own in-house wedding coordinator. We have seen some lovely weddings out front of the pavilion amidst the beautiful manicured gardens! It is an indoor and outdoor event venue. It has a beautiful historic ballroom. They can host anniversary, birthday, corporate, social, parties, and celebration of life events. 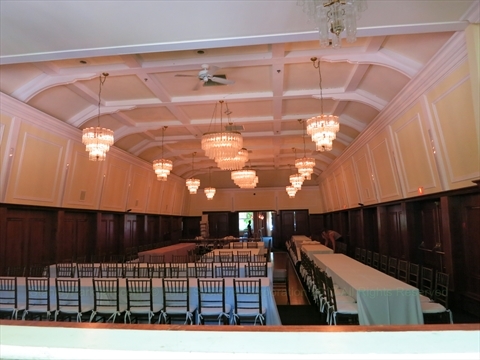 There are 4 spaces for events: The Lord Stanley ballroom, The Tearoom, Stanley's Bar and Grill, and Pavilion Park Lawn. The pavilion can host events for up to 300 people. 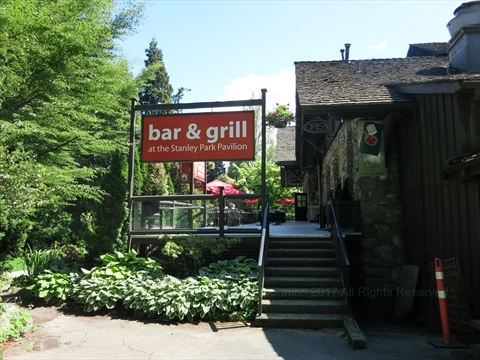 Stanley's Bar and Grill is located inside the Stanley Park Pavilion. It has a westcoast inspired menu and serves craft beers and BC wines. It has a large patio that is open during the summer. It is awesome to sit on the patio and have a cold beer on a nice sunny day amid all the tall trees! The Stanley Park Ecology Society has their offices at the Stanley Park Pavilion. They host workshops here. Also, many of their nature discovery walks start at the offices or at the nearby Bus Loop. Where is the Stanley Park Pavilion in Stanley Park, Vancouver, B.C., Canada? 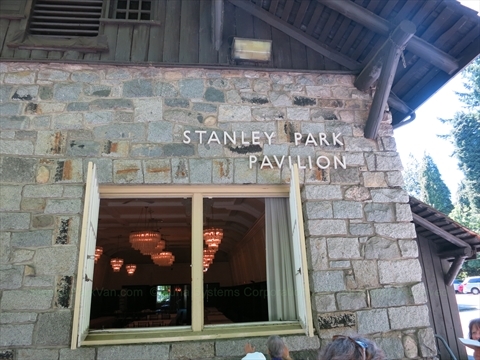 The Stanley Park Pavilion is located at 610 Pipeline Road in the middle of Stanley Park, just to the right Pipeline Road after the Rose Garden. Where is near the Stanley Park Pavilion in Stanley Park, Vancouver, B.C., Canada to see? 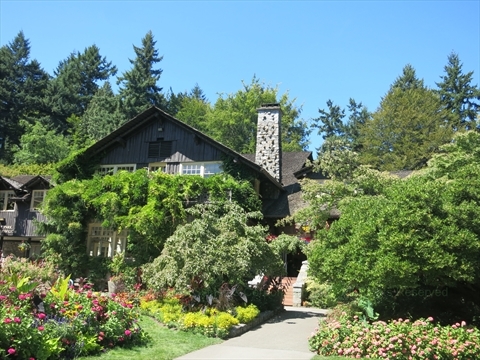 There is lots of things to see right near the Stanley Park Pavilion including the Rose Garden, Rock Garden, President Harding Memorial, concerts and musicals at the Malkin Bowl. Close by are the Miniature Train Ride, Vancouver Aquarium , and Lumbermens' Arch among many others. How to get to the Stanley Park Pavilion in Stanley Park, Vancouver, B.C., Canada? 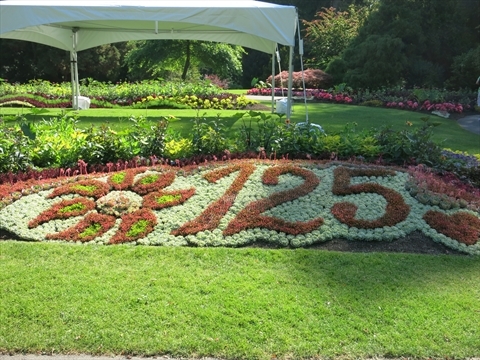 By Car: Take the Georgia Street entrance to Stanley Park, continue to the traffic circle and take the farthest (i.e. straight ahead) exit from the traffic circle to end up heading north on Pipeline Road. Turn right on the next street where the garden ends and turns into tall trees after the Rose Garden big sign. By Bicycle: From the end of Coal Harbour, take the bicycle path over the old Entrance Bridge (to the left of the Stanley Park Seawall) and continue north along the path past the Lord Stanley Statue for about 1 km and you will arrive at the Stanley Park Pavilion. By Bus: Take the #19 Stanley Park bus to the Stanley Park Bus Loop. From the loop you can see the back of the Stanley Park Pavilion which is only about 50 metres away. Where to park for the Stanley Park Pavilion in Stanley Park, Vancouver, B.C., Canada? The Stanley Park Pavilion has only a few paid parking stalls on the side of it. However, there is a large parking lot just behind the pavilion and the Bus Loop at the Stanley Park Junction. Additionally, there is a large overflow parking lot across Pipeline Road from the Stanley Park Junction parking lot. 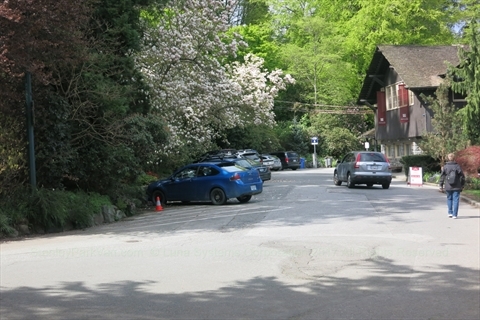 For more information about parking see: Parking in Stanley Park.